United vs City. Mourinho and Zlatan vs Guardiola. Red vs Blue. With fireworks set to go off tomorrow afternoon at Old Trafford, both clubs will be looking to end each other’s perfect starts to the Premier League campaign. However, in this article, I will be focusing on what José’s men need to do to win the big game. 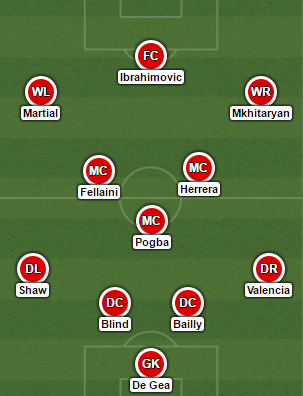 This is how I would like Manchester United to lineup vs City, in a 4-3-3. Starting from the back five, I think this is the “no-brainer” selection that any competent Manchester United fan would pick on current form. David De Gea has yet to concede more than a single goal this season, Eric Bailly and Daley Blind have complimented each other beautifully, with the latter picking up 3 out of 4 man-of-match awards, as well as the United Player of the Month Award, and Luke Shaw and Antonio Valencia have both looked at their best this season. Anyone in competition with these five will find it very difficult to get a spot in this defence. Moving into midfield, I think the ideal 3 would be Paul Pogba, Marouane Fellaini, and Ander Herrera. Where else to start off but Paul Pogba. The record-breaking 89 million pound signing is one of, if not the most, complete versatile midfielders in the game. Passing, heading, shooting, tackling, dribbling – he can do it all. Being so well rounded allows to him to play anywhere in that midfield three with relative ease. We all know Fellaini is a pretty limited footballer and can also be a big liability at times. Yet, this season, under the new manager, he has shown how he can do the “simple things” brilliantly. Intercepting the ball at both low and high points on the pitch, getting stuck into challenges and giving short passes to more creative and able players are all instructions which Mourinho has seemingly handed over to Marouane. Next, Ander Herrera. The Spanish midfielder endured a frustrating time under Louis van Gaal. Whether it was being out of the team through injury, being dropped or playing out of position, Herrera never really got a consistent run of games under the former manager. However, I feel like Mourinho can really get the best out of a player like Herrera and it will be interesting how he kicks on this season. Our newly acquired Armenian, Henrikh Mkhitaryan, has arrived in Manchester coming off the back of a standout season in Dortmund, during which he bagged 11 goals and 15 assists on the right-hand side. He has shown glimpses of his quality this season, and I’d like to see him work his magic down that right-hand-side in the derby. “Golden Boy” Anthony Martial, seems to have adapted to playing on the left-hand side (although I would like to see him play up front eventually), and although he has had a slow start to the season, his strength on the ball, quick feet, and bags of pace will certainly be a threat to any full-back the opposing team have to offer. Finally, Zlatan Ibrahimović. The stage is set for the Swede and Mourinho to renew their heated rivalry with Pep. ‘Old man’ Zlatan has arrived in the Premier League in style, scoring 3 in 3 and silencing the critics which have widely doubted his ability to do well in a more challenging league. His physical presence, clever interplay with others and his clinical finishing should cause problems for John Stones and co. Pep Guardiola has also enjoyed an exciting start to the season, with his side currently topping the league on goal difference. After watching their matches this season, it was interesting to see some aspects of the “Guardiola play” already being implemented into this team. John Stones has looked composed and reassured at the back, something he failed to do last season under manager Roberto Martinez. His intelligence on the ball, as well as his distribution, makes him the perfect mould for a typical Pep centre-half. However, the player who has surprised me most in the City defence is Aleksandar Kolarov. Somehow, in someway, Pep has managed to turn him into a half decent centre back, which is shocking, since he was allegedly considered one of the first out the door during Pep’s reign. I also expect Claudio Bravo to slot into the goalkeeper spot. He will bring much more technical ability on the ball than Willy Caballero, and is also a better shot-stopper than the Argentinian. With İlkay Gündoğan being passed fit for the derby, the City midfield will have even more depth than it already has. I feel that if Gündoğan was to come into the starting XI, he would take the place of David Silva, who is currently the weakest link in the midfield which played against West Ham United. His addition will bring even more of the possession style football that Guardiola is trying to embed into the team. Fernandinho and De Bruyne are both players that I rate highly, and the two, along with the German midfielder, will certainly be hard to stop on the counter attack, as well as being broken down defensively. Sergio Agüero’s controversial ban will certainly be a disadvantage to Manchester City. but that doesn’t mean that they will lack quality in attack. Raheem Sterling has started off his campaign with flying colours, as the English winger has not only got himself 2 goals and 2 assists, but also a Premier League Player of the Month award, which will certainly give him an extra boost of confidence. His pace and trickery down that wing will certainly be Valencia’s/Shaw’s toughest test yet. On the opposite flank, Leroy Sané could cause similar problems for the Manchester United full-backs, with the young German being scheduled for his Premier League debut. Up front, there is the possibility of either Nolito or Iheanacho being the spearhead of the City attack. I personally feel the latter will be more of a danger to the United defence. Kelechi’s pace and power on the ball, as well as his intelligent runs inside the box, would be very hard to deal with, along with the other City forwards. On form, the teams are inseparable, with the likes of previously mentioned players, such as Kolarov and Fellaini, playing well under new managers. However, I feel that United have a big advantage in one aspect, and that is the height and strength of some of the players in the current starting XI. Yes, Guardiola might have the more technically gifted array of players which fit his style, but I feel Mourinho could set up his team to counteract that. Zlatan, Pogba, Fellaini, and Bailly are all players which can dominate this City team with their physicality and height. Putting Fellaini onto Stones would certainly cause problems for the young Englishman, and would allow more able players to terrorise the opponent. This advantage will obviously also help on set pieces. Another weakness that I feel Manchester United can exploit is the full back system which Pep plays. The Spaniard tells his wide defenders to push into the midfield which leaves the wings open for Martial and Mkhitaryan to get in behind and heavily expose the City defence. Zabaleta and Clichy are certainly not the best pair in the league, but they are even less effective when played in this way. Finally, I’d like Mourinho to bring on Rashford sooner rather than later in the second half if things aren’t going to plan. His meteoric rise to the top is continuing, with the young Mancunian grabbing a hat-trick for the England U21’s this week. His qualities are well known to all Manchester United fans, and his addition to the team would certainly be welcomed. Overall, this will be the toughest task Mourinho’s men have yet to encounter this season. 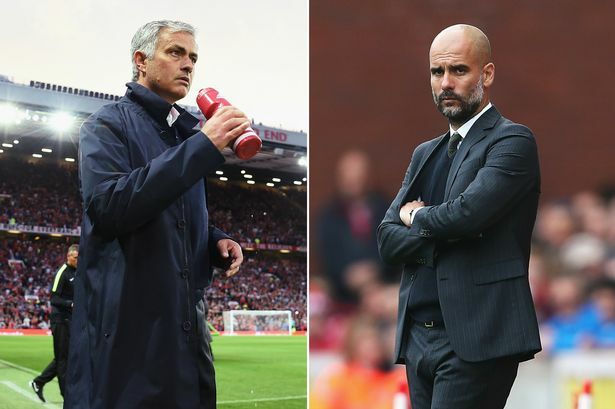 Pep will certainly look to continue his positive one-on-one record with Mourinho and I’m sure both managers will look to outsmart each other constantly throughout the match. On the day, I feel both teams might just cancel each other out and a single moment of brilliance might decide who gets the three points. Right now, it’s too difficult to pick who will come out on top, but my heart is saying Manchester United 2-1 Manchester City. Hopefully, that comes true.